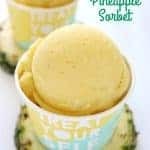 If you are needing an easy refreshing cold treat or dessert this 2 Ingredient Pineapple Sorbet will be perfect. With one some pineapple and a bit of sugar, you can whip this one up in no time at all. Perfect on a hot summer day! Peel, core and cut pineapple in chunks. Place in zippered bag and freeze for several hours. Place in blender or food processor and add sugar.